At our wine grape fungicide trial in Hickman, CA, our team is evaluating the efficacy of our fungicides against powdery mildew. 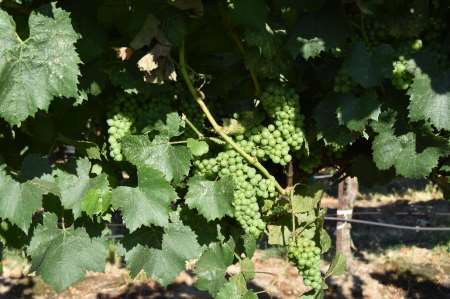 Because chardonnay grapes are so susceptible to disease, this grape variety was chosen for the trial. 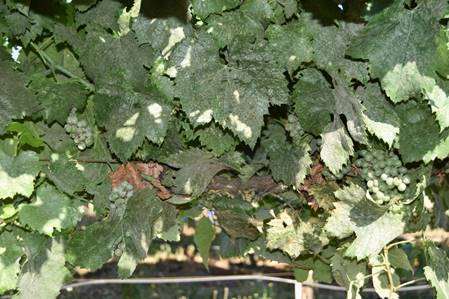 Powdery mildew is an early to mid-season disease that does its damage to both the leaves and the grapes. We’ve already begun to see it spread on the untreated areas, as you can see in the photo above. It begins to damage the leaves, affecting its ability to photosynthesize. From there, the grape clusters will have trouble fully developing, affecting yield and flavor. Getting in early applications of fungicide will help to greatly reduce the risk of powdery mildew. At Hickman, we are testing the efficacy of a new experimental fungicide, followed by an application of a fungicide with a different FRAC group (see photo above). We have set up 2 time-lapse cameras in the field, one on the untreated and the other on the treated so we can see how this new application protects against powdery mildew over the course of the growing season. Stay tuned for more information on the progression of powdery mildew in this trial and the continued protection against diseases throughout the season, such as botrytis.